Ever wanted to use an Xbox controller for your Android games? The Moga Pro hits stores today for $49.99, and in addition to playing around a bit with it at PAX East, we got some time to try out with the Bluetooth controller before it arrived at retail. There are a few things you get in the box besides the controller itself: a tiny instruction manual, a micro USB cable, and a foldable tablet stand. I'm a huge fan of this stand since it's highly portable and can support fairly large tablets at a reasonable viewing angle. Those who are familiar with the Moga Pocket controller will already know that these guys make controller accessories for mobile games, and offer developers hooks so they can optimize for the hardware. Like the first model, the Pro also includes the retractable brace to hold your Android device in landscape while you play. The Moga Pro expands on the original by more than just adding two shoulder buttons, clickable joysticks, a backlight toggle, and filling out to be more comfortable in the hand. Arguably the biggest new feature in the Moga Pro is the ability to support HID Bluetooth profiles thanks to a little switch in the middle of the controller. 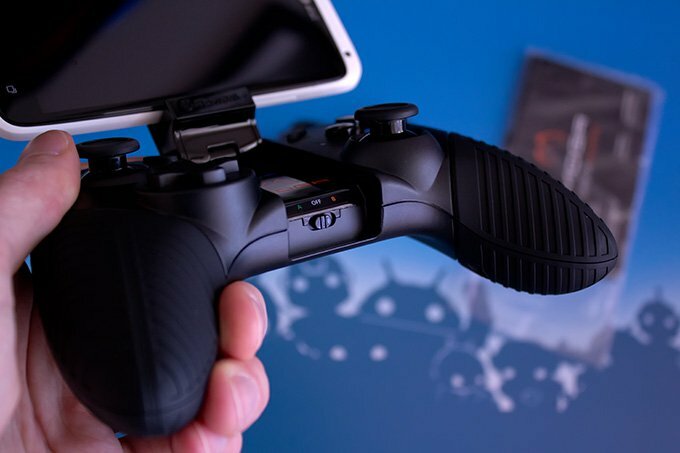 The Human Interface Device profile is most commonly used for mice and keyboards, but since a lot of gamers have been working on using their PlayStation controllers with their Android devices, game developers have taken the cue and started supporting HID input for their titles. That said, this could potentially open up the door to the Moga Pro working double (or triple) duty with PCs and consoles. Unfortunately, the best I could do was pair up the Moga Pro with non-Android devices; inputs didn't go through at all, but I hold hope that this will change eventually. You can find the HID games that work through Moga's Pivot app for Android, which showcases optimized games and helps you pair up the controller with your Android device. The catalog spans Moga Pro games, HID games, and a bunch of genre-specific sections. So, how do the games actually play? For the most part, really well. It's especially nice to be able to see the full screen and soak in a game in its entirety. The controller is about a million times more comfortable to use than the original pocket controller, plus the buttons all have the right amount of spring and give. Moga's usefulness may be restricted to titles that go the whole nine yards with control optimization and still use the dual-stick control scheme (as opposed to a more gesture-based one), or games that leverage the HID profile, but that includes more games than you would think. The only blip in performance during my time with the Moga Pro had me stuck on run mode in Modern Combat 4, but overall, the connection stayed stable. While using the HID Bluetooth profile to play Android games with proper controllers is hardly new, it's not something that a lot of more casual gamers will go out of their way to get to work. Moga Pro is aiming to make something that's easy to set up and easy to start enjoying, which I think is laudable. The controller itself is really comfortable, and well-designed for its niche purpose. Gamers that love dual-stick games but need more finely-tuned control definitely want to try out this fine accessory.